Today many visitors seek a reconfiguration of one’s self mind through the psychedelic world of Ibiza’s ceaseless partying culture. Nurtured from the 70s/80s ‘hippie culture’ spirit of ‘reaching an alternate state of mind,’ this experience is enhanced by the artificial lights, endless nights and drunken sights. The often destructive and harmful method of pursuing this path has led to the proposal Re-Mind. The tourists are offered a pilgrimage located along the tranquil bay of Cala Xuclà. It proposes an experience that pampers body and mind. Meditation and relaxation are the focus of this proposal. 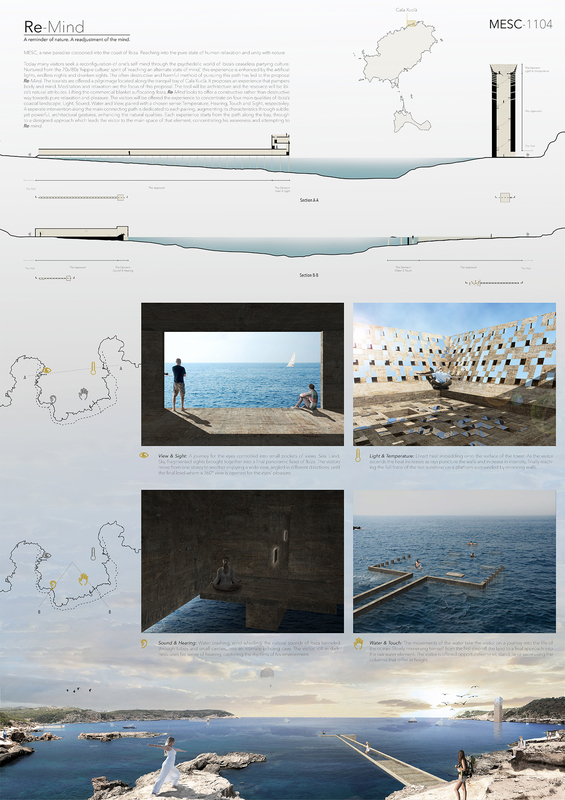 The tool will be architecture and the resource will be Ibiza’s natural attributes. Lifting the commercial blanket suffocating Ibiza, Re-Mind looks to offer a constructive rather than destructive way towards pure relaxation and pleasure. The visitors will be offered the experience to concentrate on four main qualities of Ibiza’s coastal landscape; Light, Sound, Water and View, paired with a chosen sense:Temperature, Hearing, Touch and Sight, respectivley. A seperate intervention along the main connecting path is dedicated to each pairing, augmenting its characteristics through subtle, yet powerful, architectural gestures, enhancing the natural qualities. Each experience starts from the path along the bay, through to a designed approach which leads the visitor to the main space of that element, concentrating his awareness and attempting to Re-mind. I am very happy for you two, Laurens and Natasha! Keep it going, it's so encouraging! Congratulations for this interesting proposal!